Posted By:Unknown | At:10:28 AM Be the first to comment! 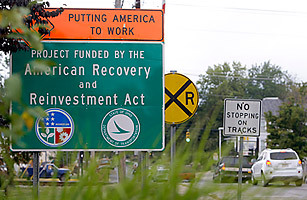 People of good faith can disagree over whether President Obama's $787 billion stimulus package is creating enough jobs, piling on too much debt, or helping the country in the long run. But it's about time to retire one set of critiques of the stimulus: that it would be riddled with fraud, hamstrung by delays, and crippled by cost overruns. So far, while the American Recovery and Reinvestment Act is clearly not a political success, it is just as clearly a managerial success — on schedule, under budget, and according to independent investigators, remarkably free of fraud. Yesterday, the administration met its self-imposed deadline of spending 70% of the Recovery Act, or $551 billion, by the end of the fiscal year. Almost all of the unspent stimulus money is already committed to specific projects, except for a few longer-range initiatives like high-speed rail and electronic health records. And the completed work has cost less than expected, so the savings have financed over 3,000 additional projects, from airport improvements in Atlanta to new child-care centers at military bases in Louisiana, North Carolina, Mississippi and Oklahoma, from a new five-lane road in Jacksonville to a $14.5 million transformation of a World War 2 ammunition factory into an eco-friendly government building in St. Louis. Meanwhile, Earl Devaney, the hard-nosed watchdog leading the independent Recovery Accountability and Transparency Board, recently testified to Congress that investigators "simply haven't seen the kind of fraud that we would have imagined as professional law enforcement." Before the stimulus passed, experts predicted the government would lose 5% to 7% of it to fraud; today, out of over 190,000 contracts, grants and loans, less than 0.2% are under investigation. The board is using newfangled computer algorithms that can track suspicious spending patterns before there's a complaint; the inspectors general of every major agency are bird-dogging the stimulus as well. Devaney likes to say that if you really want to steal, you'd be crazy to steal from the Recovery Act; it's way too transparent, with every dollar traceable at www.recovery.gov, and there are way too many eyes on it. That transparency has sometimes carried a political price; for example, innocuous reporting errors on the website quickly became national news about stimulus money supposedly funneled to phantom congressional districts. At the same time, GOP Senators Tom Coburn and John McCain have targeted a slew of Recovery Act projects they consider wasteful; although some waste is in the eye of the beholder, it's probably safe to assume that the $762,000 for interactive dance software and the $18,500 to paint a mural on a Montana band shell could be better spent elsewhere. And Devaney's staff has identified several ineligible contract recipients, leading to the cancellation of at least $18 million worth of grants.